uuid : e88ba81b-a8db-44ba-9eb9-588208eda1b6 templates_id: 119573 templates_uuid: "db40eb3c-53fc-4e0a-8350-9fa8bcfb2076" title: "Maternity Policy - Maternity Leave Policy - Standard Maternity Leave Policy" display_name: "Maternity policy" meta_keywords: "Maternity rights statement" description: "
Notify staff and managers about the statutory maternity leave regime with this maternity policy. Ensure your staff know when maternity leave can be taken as well when they have to return to work after leave. This maternity leave policy covers eligibility, notification requirements, as well as statutory maternity pay. What is a maternity policy? A maternity policy is a policy that sets out the applicable maternity leave regime and explains the statutory entitlements to maternity leave and pay. Why do I need a maternity policy? Introducing a maternity policy helps managers and staff understand the rights and obligations attached to maternity leave. It ensures staff are aware of their rights when they get pregnant and it provides assistance in their return to work. Having a maternity policy encourages equality and fairness within the workplace. What are the eligibility criteria for maternity leave? Specify when they want the maternity leave to start. When can maternity leave be taken? Immediately if the employee is sick for a pregnancy-related reason during the 4 weeks before the expected week of childbirth. What are the employee\302\222s rights and obligations during maternity leave? What are the statutory maternity pay requirements? 90% of the average weekly salary or \302\243140.98 a week (whichever is lower) for a further 33 weeks. Have at least 26 weeks of continuous employment on the 15th week before the expected week of childbirth. When should employee return to work? Employees should return to work after the maternity leave period ends, and employers must indicate the date of return in writing within 28 days from the date notifying the maternity leave. Should the maternity policy include provisions regarding parental leave? The employee may not wish to return to work after the end of the maternity leave. The maternity policy should mention that in such case, employees should notify the employer that they wish to request parental leave. For more information see our Quicg Guide on Parental leave. 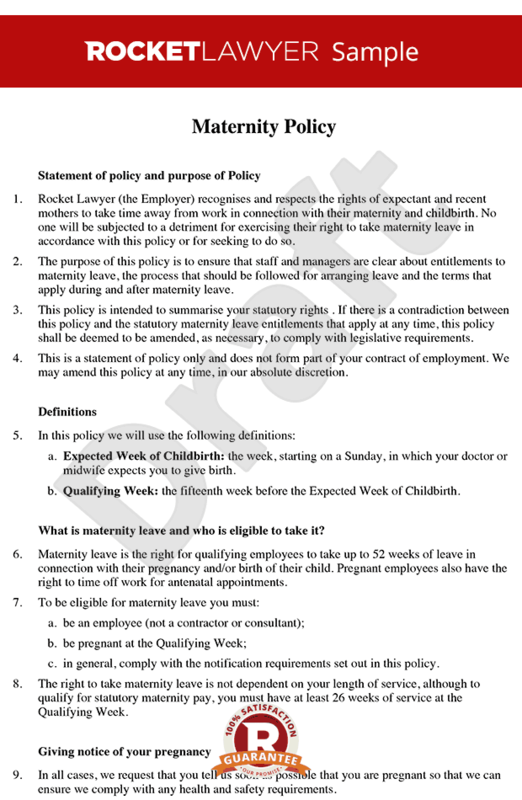 This maternity leave policy is governed by the law of England and Wales.
" created_timestamp: "2018-10-08 04:37:02.0" modified_timestamp: "2018-10-08 04:37:02.0" active: true created_by: 236 modified_by: 236 dcm_id: 281 url_slug: "Maternity-policy" meta_description: "Draft a maternity policy for your staff with simple guidance from Rocket Lawyer. Inform your staff and managers about the statutory maternity leave regime. Try this maternity leave policy for free." time_to_complete: "10 minutes"
What are the employees rights and obligations during maternity leave? 90% of the average weekly salary or £140.98 a week (whichever is lower) for a further 33 weeks. More than just a Maternity policy template, our step-by-step interview and guidance makes it easy to create your document. Easily create online, download, print and sign your free Maternity policy in minutes. This document is also sometimes called: Maternity rights statement.